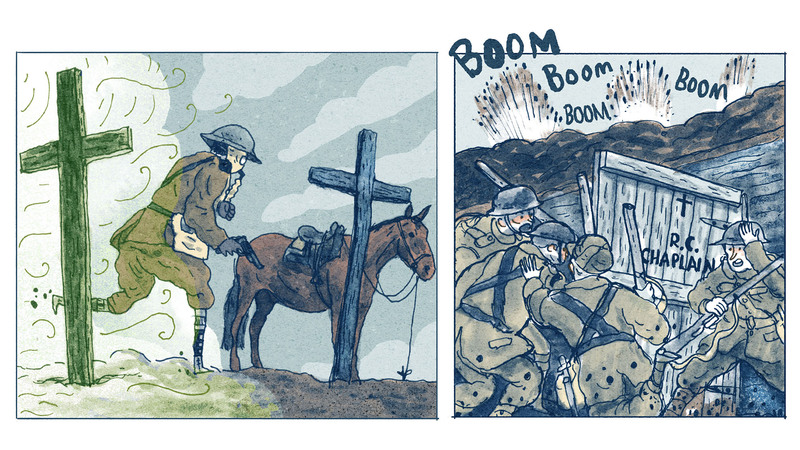 The challenge of this piece was to create a six-page long visual narrative for Stray Lines Irish Comics Anthology. 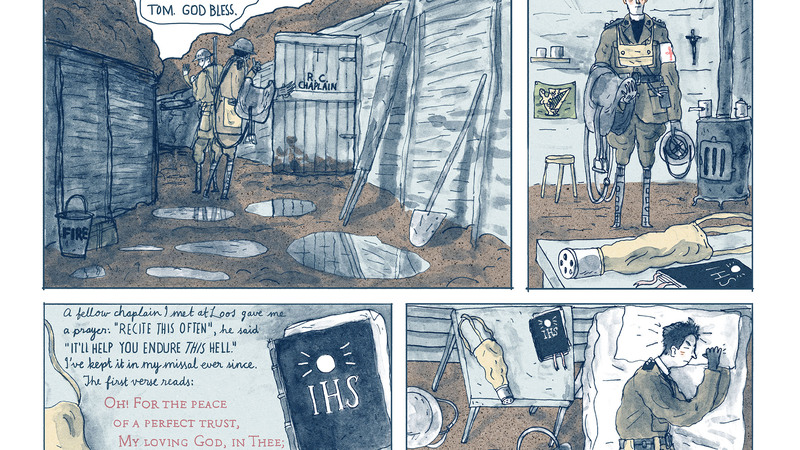 The aim of the piece was to write and illustrate a story from the perspective of an Irish military chaplain experiencing the dire, nihilistic circumstances of the First World War. I decided to portray a chaplain doubting his trust in God while struggling to serve the spiritual needs of the soldiers. The work also had to be historically grounded and accurately reflect the life of a WW1 military chaplain as much as possible. The research was key to resolving the brief, I found diaries and letters of World War One chaplains to be a most useful resource. Alfred O’Rahilly’s edited collection of Fr Willie Doyle’s diary writings (edited in 1922) was an excellent resource for understanding the psyche of a chaplain enduring the trauma of war. Often Fr Doyle would address God directly in his writings – although he would often come across as quite a resilient and optimistic character, there were certain passages where it was apparent that he had reached the limits of what he was capable of enduring. On few occasions in his diary writings, Willie Doyle mentions the mid 19th-century poem/prayer called ‘O! for the Peace of a Perfect Trust’ that he would often recite to strengthen his faith whenever it waivered. I developed the idea that the words of that prayer are being cynically picked apart by the main character. For my visual research, I looked at illustrated news articles depicting chaplains at war from the era, as well as war photography of the time. 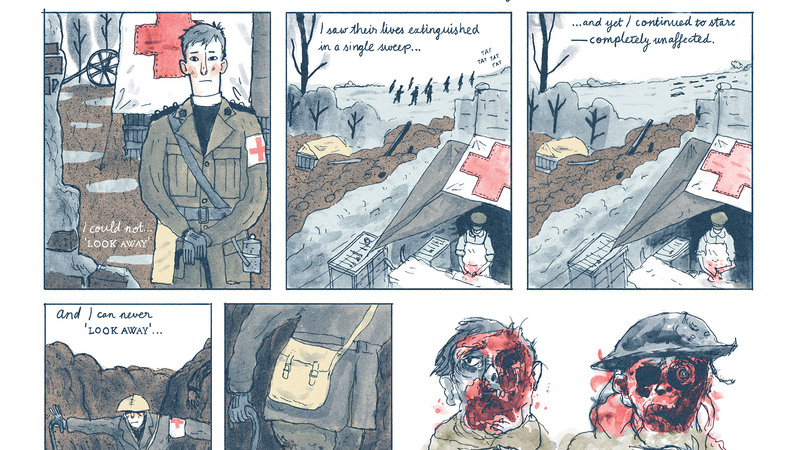 I also looked at war art, in particular, the portrait paintings by Henry Tonks, of injured soldiers with facial wounds. The illustrations in the comic were created with pen and Kansei ink, which allowed for deep tonal range and shading. A muted colour scheme was added digitally.